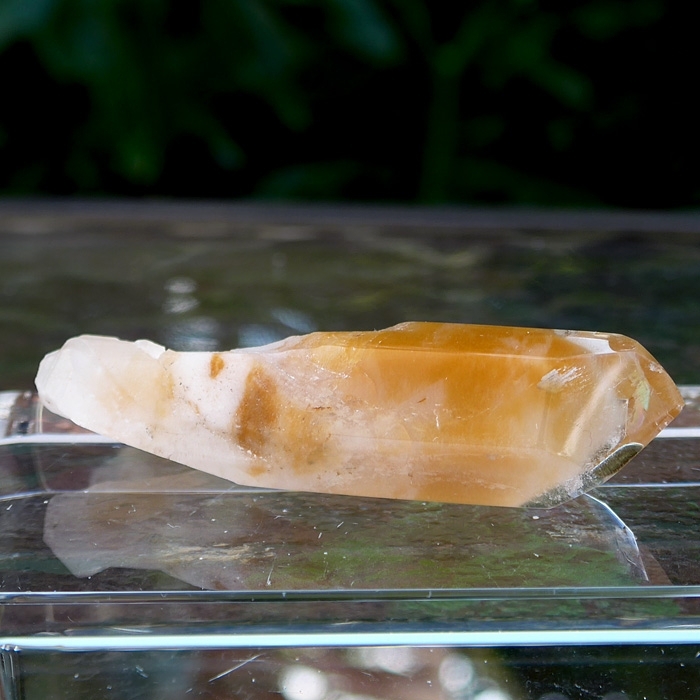 Dimensions (HxWxD): 2.45" x .7" x .45"
This fabulous 2.45 inch long Amphibole Phantom Scepter is also called 'Angel' Quartz and comes from Bahia, Brazil. This sweet tall little point is small enough to put in your pocket or keep under your pillow, by the beside or on an altar. A client could easily use this to hold during a treatment. Amphibole quartz has long been known among mineralogists and rockhounds as a desirable, unusual collector's item, and has recently come to the attention of metaphysical crystal collectors and Lightworkers because of its rich blend of mineral inclusions, which give it a unique set of energetic properties. Because Amphibole Quartz stimulates the third eye and crown chakras, it is considered to be useful for connecting to the higher-self, for astral travel, to promote lucid dreaming and to facilitate interdimensional communication. This Amphibole Point contains inclusions of such metaphysically potent minerals as Limonite, Kaolinite, Hematite, and Lithium. The combination of these minerals serves to soothe, shield, enhance mental faculties & accelerate spiritual change. Amphibole quartz is the name given to a rock crystal formation consisting mainly of hornblende amphibole, the use of the term being restricted, however, to metamorphic rocks. The word hornblende is derived from the German “horn” meaning “cornucopia”, or “horn of plenty” and “blende”, meaning “to blind or dazzle”. Hornblende is not a recognized mineral, but is used as a general or field term to refer to a dark amphibole. Hornblende is an isomorphous mixture of three molecules; a calcium-iron-magnesium silicate, an aluminium-iron-magnesium silicate, and an iron-magnesium silicate. This fine specimen of hornblende quartz, or amphibole quartz, is some of the most amazing quartz you will find, with mineral inclusions of such metaphysically significant minerals as Limonite, Kaolinite, Hematite, and Lithium. The dazzling combination of metaphysically potent minerals found in this specimen of amphibole quartz strengthens body, mind and soul. 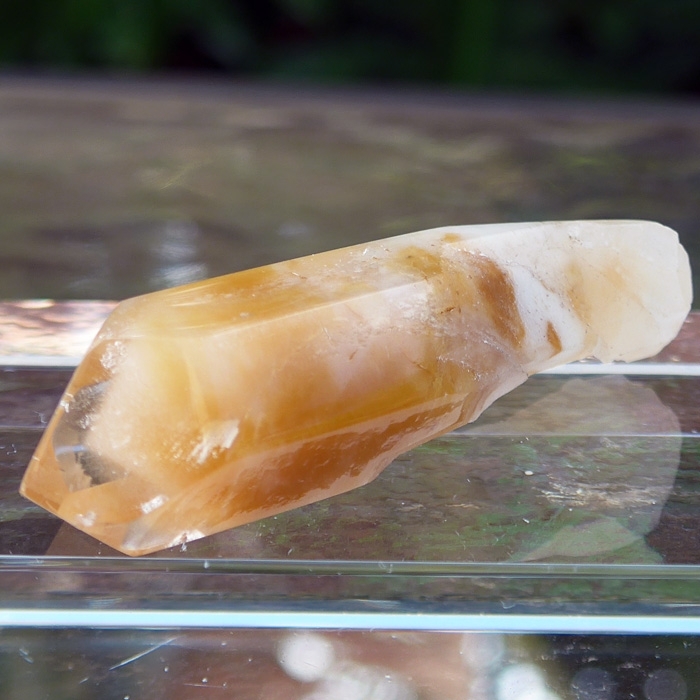 Amphibole strengthens the will, quiets the mind, relaxes the body, activates the Higher Mind and connects the bearer to the Divine Wisdom found in angelic realms. Amphibole is useful for connecting to the higher-self, for astral travel, lucid dreaming, and even interdimensional communication. Amphibole quartz is also known as "Angel Phantom Quartz", a name given to this unique type of quartz by Robert Simmons and Naisha Ahsian, in their new publication, "The Book of Stones". Because Angel Phantom Quartz stimulates the third eye and crown chakras, it is considered to be useful for connecting to the higher-self, for astral travel, to promote lucid dreaming and to facilitate interdimensional communication. This Angel Phantom Point contains inclusions of such metaphysically potent minerals as Limonite, Kaolinite, Hematite, and Lithium. Limonite, also known as Lemon Rock, is a form of hydrated iron oxide. Commonly occurring as a yellowish-brown amorphous substance, limonite is mined for use as iron ore.
Limonite is known by metaphysical rockhounds as a stone that promotes ease and grace, stability and comfort. Limonite is also said to provide mental protection, shielding the bearer from detrimental thought forms, muddy thinking and psychic attack. Limonite has been used in treatment of disorders of the liver. Kaolinite is a soft, earthy, usually white clay mineral sometimes offering a rust appearance caused by iron oxide. Kaolinite has been used to soothe an upset stomach, and was for many years the active ingredient in the over-the-counter anti-diarrehal medicine Kaopectate. 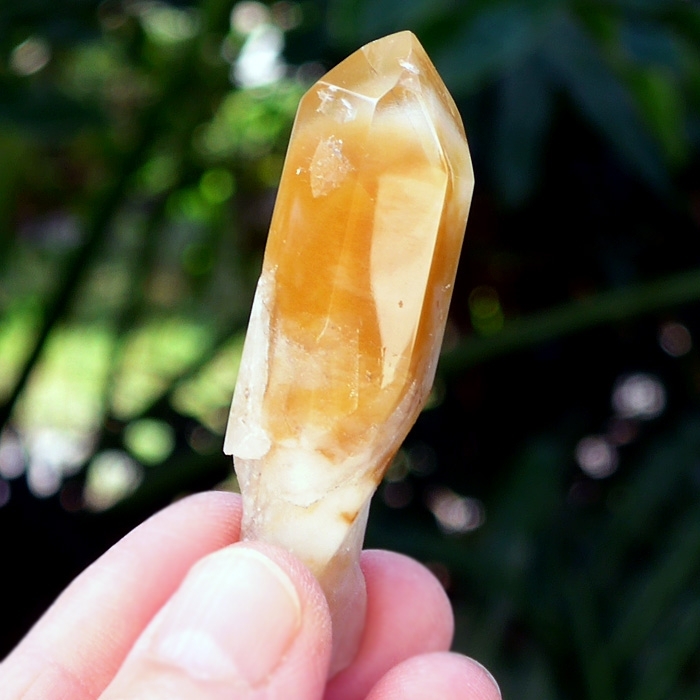 Crystal healers have used kaolinite to aid in situations where accelerated spiritual progress has taxed an individual's ability to process, digest and transform mental, emotional and karmic issues in life. Kaolinite provides for a strengthening of the bearer's will forces as well, enabling the individual to progress along the path of Spirit more smoothly as a result. Kaolinite has also been used to treat digestive disorders and to clarify, tonify and smooth the skin. Hematite is the most important form of iron ore, occurring as heavy, fragile, opaque granular masses, often with a ruddy red hue. Hematite crystallizes as grey-black to reddish colored rhombohedral and tabular crystals, rosettes and in a variety of more unique formations, all with a metallic luster. Hematite promotes a grounded meditative state very helpful to those seeking to unite heaven and earth within themselves. Hematite is used by crystal healers to ground one's energy when one is feeling spacey and severs to energize the root chakra. The lithium in this beautiful specimen is a soft silvery-white metal found as a trace element in many types of minerals, including spodumene, petalite, lepidolite, kunzite, and quartz crystals. Lithium salts are used medically to treat both mania and depression. Note: Above weight is shipping weight. Actual weight is 21 grams or .74 oz.